Geneviève L’Heureux received her Bachelor of Architecture from Université de Montréal and in 1994, her Masters of Architecture from McGill University. She practiced architecture as principal and co-founder of Atelier in situ until 2002, earning several high distinctions and prizes, namely the Grand Prix d'Excellence in 1998 and the Rome Prize in 2001. It is in Rome that she initiated her work on shadows and developed a passion for printmaking. After moving to San Francisco in 2000, Geneviève taught California College of the Arts for several years. Today she focuses primarily on printmaking. She is a member of Graphic Arts Workshop and prints from master printmaker Paul Mullowney's shop in San Francisco. Unfolding is composed of sixteen sheets presenting different ways to unfold the same archetypical house. 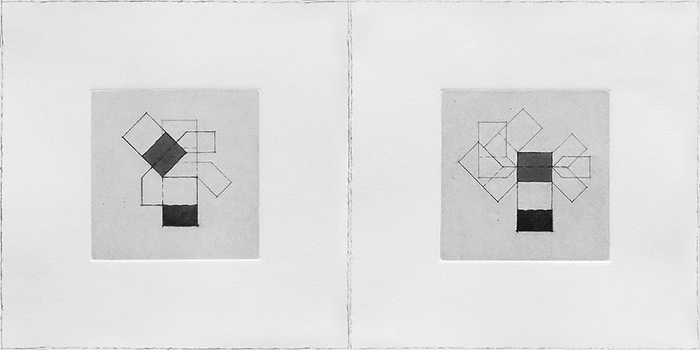 Organized per affiliation, this serial work reflects on lineage, repetition and variation. More information about Geneviève's work can be found on her website.